WTOP Garden Editor Mike McGrath answers your questions about hornets' nests, hungry and horny deer, and planting roses. What would Elmer Fudd do? Sia in Upper Marlboro writes: Attached are photos of a wasp nest that has been around since the summer. We didn’t knock it down for fear of angry wasps. Is now a good time to knock it down? And how do I prevent it from returning? The best thing to do when you see a hornet’s nest is nothing. “Nothing” is somewhere between often and always the best choice when you face a non-challenge like this nest. ‘Return of the Hornets!’? Not likely. 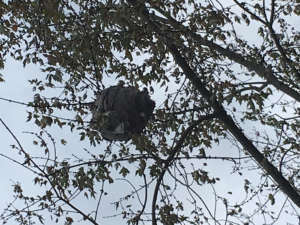 Sia in Upper Marlboro sent us some photos of a classic hornet’s nest up in a tree and asks: How do I prevent it from returning? Once again, the answer is: Do nothing. But you can also just leave it up there. These and other “social hornets” build new nests every year; the old nests are never reused. 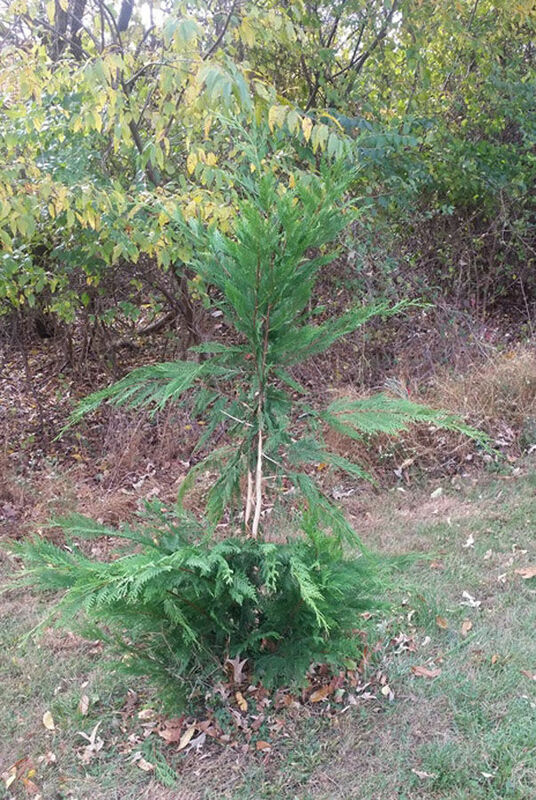 Connie in Reston writes: Deer have “debarked” my pine trees; planted last year, the trees are around 5 feet tall. The damage is roughly a 12-inch-wide scar on each tree, about 2 to 3 feet above ground. What’s the best way to save my trees? Any ideas how I can prevent this in the future? Connie’s photos show some pretty sad-looking little trees that were left unprotected out in the open, and thus, destined to be deer, mouse or rabbit candy in one way or another. The first answer is that they can’t be saved if male deer removed a complete circle of the bark while “velveting off” their antler coverings with vigorous rubbing. And even if the circle isn’t complete and they do survive, they will likely always look sad — so I would plan to replace them in the spring. Young bucks “velveting” their antlers against young trees often cause damage that’s almost certain to be fatal. And if it isn’t horny, young bucks rubbing, it’ll be both sexes eating the tender new growth and/or rabbits, mice and/or voles attacking the tasty young bark down below. The best defense for newly planted (two years or less) and all especially important trees and shrubs is a welded wire cage placed around the plants to protect them — especially over the winter, when natural food is scarce for the wild things. 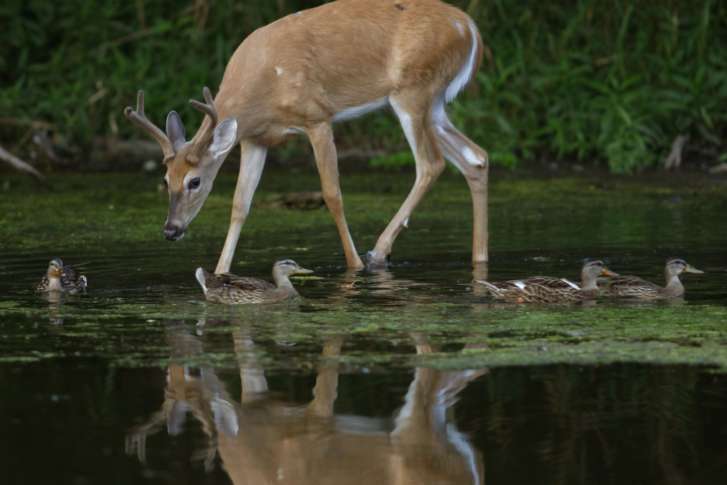 Your other option is to spray a high-strength deer repellent down low for the vermin, and then spray heavily again at “browsing height” — 2 to 3 feet off the ground — to try and deter biting by Bambi. Ah, but here’s the rub: Sprays won’t stop those horny bucks from rubbing away. If you want complete protection, cage the plant and spray down low to keep small critters at bay. Ms. Simpson in Riverdale Park writers: I just purchased two rose bushes. Is it too late to put them into the ground? No, it is not too late. And perhaps, more importantly, there isn’t really any other option for the health of the plants. Choose an area with good sun — especially morning sun — and dig holes that are wide but not deep. Refill the holes with only the soil you removed; do not “improve the soil” in the holes with peat or other seemingly-good ideas. Then, mulch around the plants with an inch or two of compost or shredded leaves — not any kind of wood or bark mulch and not whole leaves. Then, just leave them alone for now. Give the plants a gentle pruning after new growth appears in the spring and rosy your future should be.